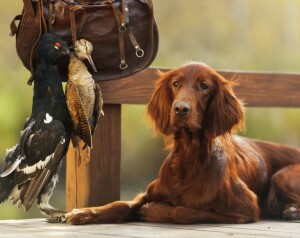 The very first gundog I owned after leaving home as an adult, was a rescued Irish Red Setter. I taught him to recall, quarter, and retrieve a dummy, but never worked him. He had a long galloping lope and covered a vast beat. He was a glorious sight to see out on the Surrey heathland, but not really suited to our predominantly woodland Surrey shoots. Like so many gundog breeds, working lines have become separated from show lines, and if you want a red setter to work as a gundog, you need to pick your breeder carefully. [wp_ad_camp_1]My setter was a show version, a very tall dog and elegant dog, with long ears and quite a blocky head. The working red setter is a somewhat more compact animal. Both strains are wide ranging dogs. They need a lot of exercise and are best suited to open moorland. They take quite a bit of feeding and grooming to keep them in shape. In the UK, in Field Trials, pointers and setters are not required to retrieve, but plenty are capable of doing so, to some degree. I had no problems teaching my dog to retrieve a dummy, which greatly enhanced our (long) walks. But I doubt if he would have had the retrieving desire to cope with the kind of training programme I put my dogs through today. Here’s a link to the Kennel Club’s information about these beautiful dogs: Irish Setter. Ownership is definitely not for the faint hearted or unfit, and those looking for a retrieving companion, may be disappointed.